o Use unleaded fuel only. o Maintain the engine in good operating condition. Extremely high catalytic converter temperatures can result from improper operation of the electrical, ignition or multiport electronic fuel injection..
o If your engine stalls, pings, knocks, or is hard to start, have your Hyundai dealer inspect and repair the problem as soon as possible..
o Avoid driving with a very low fuel level. Running out of gasoline may cause the engine to misfire and result in damage to the catalytic converter..
o Avoid idling the engine for periods longer than 10 minutes..
o The vehicle should not be pushed or pulled to get started. This may cause the catalytic converter to overheat and create a fire hazard. 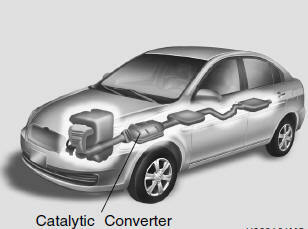 o Do not touch the catalytic converter or any other part of the exhaust system while the catalytic converter is hot. Shut off the engine, wait for at least one hour before touching the catalytic converter or any other part of the exhaust system. o Remember that your Hyundai dealer is your best source of assistance. o Do not park, idle or drive your vehicle over any combustible material such as grass, paper, leaves or rags. These materials might contact the hot catalytic converter and a fire might result.